1980 is the year that tennis fans consider the most important in the history of the sport. It was the year the most epic battle took place on the fields of Wimbledon, the one that changed the face of the sport forever: when reigning champion Björn Borg met up-and-comer John McEnroe, his challenger for his fifth championship win. On the surface, the two men could not have been more different. Here was the introverted, cool, disciplined Swede, master of the precise groundstroke meeting his opponent, the loudmouthed, profane hothead from America, a youngster who was all about the serve and charge, doing all he could to intimidate his opponents with runs against the net. Called “fire and ice” by journalists at the time, their story makes Roger Federer’s and Rafael Nadal’s look like child’s play. It was the first time in the history of sport that a rivalry was played up by the press to that degree. Their fights, on and off the court, culminated in a never-before-seen match at Wimbledon, lasting five sets including a punishing, 30-minute tiebreaker toward the end to decide the fourth set. The crowd, usually reserved and polite, was very much on Borg’s side, hoping to witness their favorite to win a fifth crown. Danish documentarian Janus Metz makes his first feature here, working from a script by Ronnie Sandahl, a former sports reporter. He hired Sverrir Gudnason to play Borg and Shia LaBeouf to inhabit McEnroe. It is perfect casting: Gudnason’s laid-back personality serves the role just as well as LaBeouf’s known mania does for the part of the craziest tennis player the world ever knew. For anyone old enough to have watched Borg in his heyday, Gudnason’s striking resemblance to the real player is almost eerie. He is the lead in the film while LaBeouf is the screaming supporting part. People who watched them go against each other, often considered Borg the perfect Swedish specimen in the clichéd version of a Ken doll, the way he was painted by the media. The film does away with this, showing him as a complicated man. 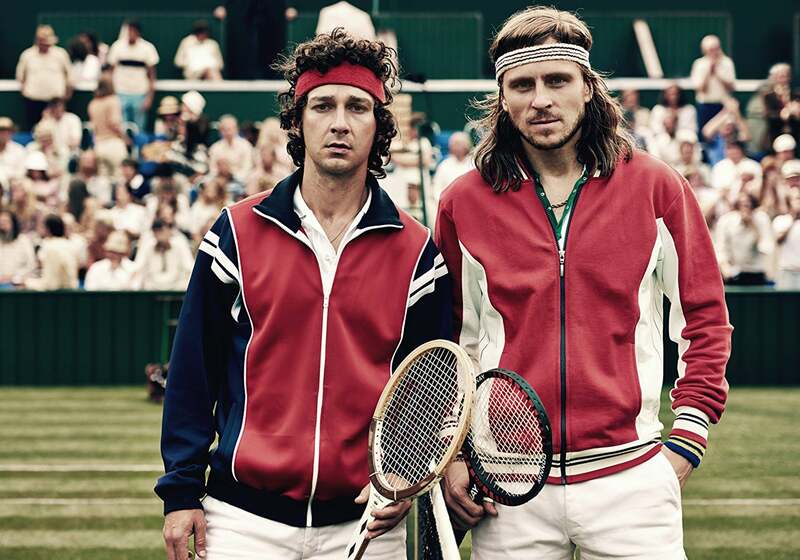 What we learn from Borg vs. McEnroe is that behind all their differences the two competitors were similar in many ways, from their childhood struggles to their fierce determination to dominate the sport. McEnroe may not have had any filter, shouting anything that came to his mind, but the grown-up, quiet Borg whose intensity simmers beneath the surface, used to throw tantrums against his coach, played by Stellan Skårsgaard, until he was told to never show any emotion. Had he not been raised like that, he may have acted just like McEnroe later on. Borg’s upcoming marriage to his childhood girlfriend, Romanian Mariana Simionescu (played by Tuva Novotny who was last seen in Annihilation), who wants him to give up tennis and enjoy life with all the money he has made, is a small but interesting side story. The film shows their early years through flashbacks and closes the circle in the end when the two accidentally run into each other at the airport, waiting to board their flights after the grueling battle on Wimbledon’s center court.